Last week Apple announced the new iPhone 5s, 5c models with new iOS 7 in the market. After this apple guys update the windows iCloud control panel with some new features. The new feature you will see in the iCloud control panel is iCloud Bookmarks. iCloud Bookmarks allows you to sync all your bookmarks from Internet Explorer, Firefox, or Google Chrome to your Safari bookmarks on iPhone, iPad, iPod touch, and Mac. With the help of this new feature you will easily sync all your windows browser Bookmarks to your Apple iOS devices. To use this feature all you need a free iCloud account, Firefox and Chrome addon installed on your browser and iCloud control panel application for your desktop. iCloud is apple’s free cloud service for all its users, which you will use to sync files from your device to your online cloud account. If you don’t have the iCloud account, visit this page and create a free account with iCloud storage account. With a free account you will get 5GB storage space, if you need more storage for your account then you will buy it from their additional plans. Once you are ready with you iCloud account follow the below mention guide to Sync your desktop browser bookmarks with your iCloud account. 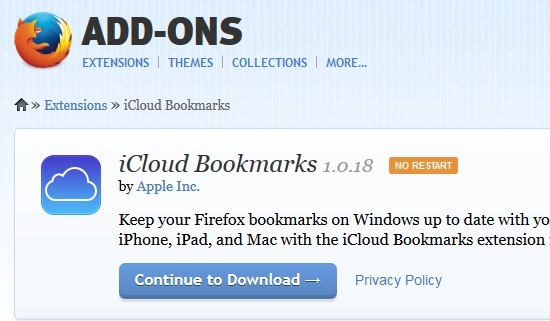 In this guide we are using the Firefox Browser to sync all bookmarks with iCloud Storage account. Step 1. 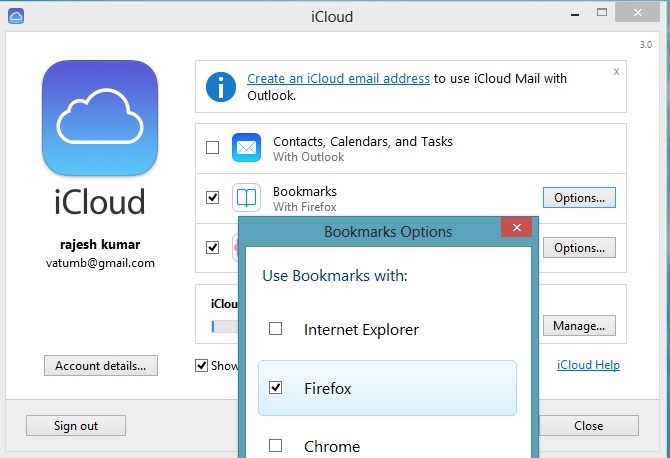 Download the iCloud Bookmarks for Firefox on your browser and install it. You will find the download link at the end of this post. Step 2. Once the addon will installed on your browser, you will see the new iCLoud icon on the Firefox toolbar, click on it to download the iCloud control panel on your windows desktop. Step 3. Install the iCloud Control Panel on your desktop. Now run the application and login with your iCloud User ID and password. After the login, you will see lots of option on the application screen such as Bookmarks, Photos, Contacts, email etc. Click on the Bookmarks option and select the browser and hit the apply button from the application to sync the bookmarks with your icloud account. Now your bookmarks are synced with your iCloud account, with the sane way you can sync your Chrome and Internet Explorer Bookmarks.